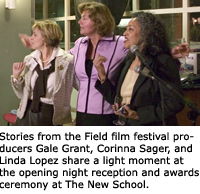 For a second successful year, MCA-I NY presented Stories from the Field, the United Nations Documentary Film Festival, bringing 40 new documentary films and PSAs to New York audiences. 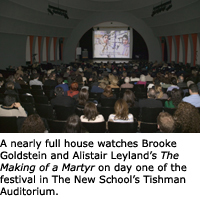 The festival took place over the weekend of April 22-23, 2006, at The New School. One hundred eighty entries from countries on five continents were judged for this year’s competition. 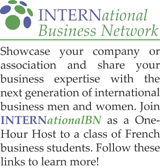 Nations represented included Burkina Faso, Canada, China, Germany, India, Iran, New Zealand, the Philippines, South Africa, The Former Yugoslav Republic of Macedonia, Venezuela, the United Kingdom, and the United States. 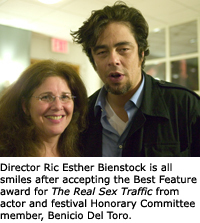 Award-winning actor, Benicio Del Toro, and Festival co-producer, Corinna Sager, presented the awards at an opening night reception attended by filmmakers, sponsors, Festival officials, and press. 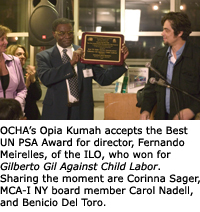 Stories from the Field is presented by the Media Communications Association – International, New York Chapter (MCA-I NY), in cooperation with the United Nations Department of Public Information.